Father's Day is three weeks away. You should plan ahead and think about some of the different foods you'd like to serve. 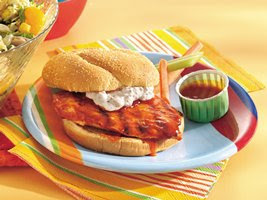 A great recipe idea comes from our own kitchen - grilled buffalo chicken breasts. They are absolutely delicious! I make this dish once a week for the family, and it's so quick and easy. Below is the recipe, followed by a few ways to prepare this mouthwatering meal. Place the chicken breasts in a zip lock bag with Frank's sauce, olive oil, and black pepper. Massage the chicken/sauce in the bag until it is well mixed and completely covered. Let it sit for 1 hour to marinate. Using tongs, take the chicken out and place the breasts on a pre-heated grill at medium heat. Cook for about 15 minutes, or until the outside of the chicken is starting to char on the edges. Serve with blue cheese or ranch dressing. As a side, serve fries, carrots, and celery sticks. 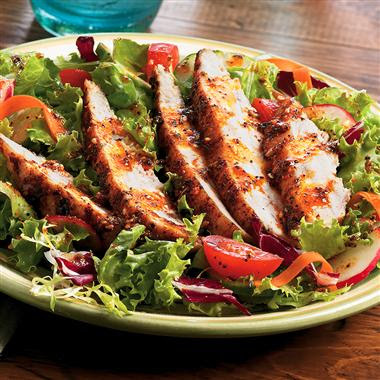 Chicken salad is another option. After grilling the chicken breasts, I cut them up into pieces, and serve on a bed of lettuce. I add tomatoes, cucumbers, peppers, cheese cubes, and garnish with grated carrot. Pumpkin seeds and/or cashews are an option as well. Drizzle blue cheese, ranch dressing, or balsamic vinaigrette, on top, and enjoy - I promise, you will! One more option is to make a chicken sandwich. Grill the breasts and place them in buns. Use sliced tomatoes, lettuce, and ranch or blue cheese dressing. Yum! The Gift That Makes Perfect "Scents"
Canada Day Party Food Ideas, Eh!